That design ethos is getting stronger too, or at least it feels that way given the continued attention to details in this release. There are many other small, easy-to-overlook visual improvements which, while they may not jump out at you, go a long way to making the overall experience of Ubuntu feel much more polished than other Linux distros. A good example of this is new borderless application windows that get rid of the one pixel, nearly black border element. An equally small, but nice, touch is the new GTK3 window decorations, which mean much smoother anti-aliased corners - something that might not be noticeable without a high-resolution screen, but will be much appreciated if you have one. A more noticeable example is the new live window resizing. When you drag a window, Ubuntu no longer draws a yellow box to visualize the window being resized, instead the window just resizes - this has been an option in previous releases, but it's now the default. If such tiny UI refinements don't impress you then Ubuntu is probably not the Linux distro for you. But for those who, like me, have been wondering for years when someone would start giving the Linux desktop the UI attention it deserves, well, Ubuntu 14.04 is unquestionably the best option around. That said, this is open source software and nothing is ever perfect. As such, Ubuntu 14.04 LTS contains two big catches. One is the fact that Unity means you’ll almost certainly need a new PC. Its slick user interface isn't going to sing on your five-year-old netbook - that's what Crunchbang is for. The other, more serious problem is the controversial changes regarding online search and user privacy since 12.04 LTS. The taint of Ubuntu's privacy blunders with the last few releases have cast a shadow over the distro that used to be a favourite of Linux newcomers and old hands. 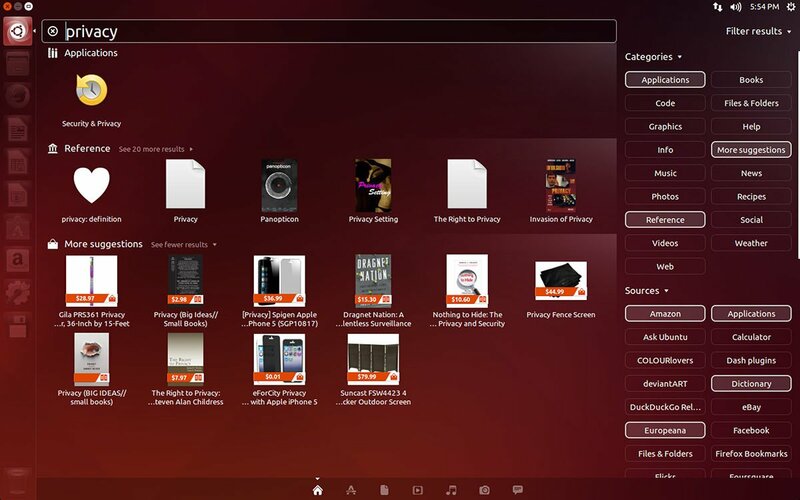 Ubuntu 12.10 introduced an on-by-default Amazon search filter in late 2012 - just after the last LTS edition earlier that year. That meant shopping suggestions from Amazon could be added to results from your desktop search. Results could be sent to Amazon via Canonical's servers so links to products related to the queries shown in the results. The resulting furor saw Canonical promise a kill switch that let you disable this feature. Exposing your data as an individual is one thing, but at least disabling it is relatively easy. Less so for organisations running Ubuntu on lots of PCs and moving to 14.04: that’s a heck of a lot of privacy controls to adjust and Scope settings that need disabling. The good news is that it appears Unity's privacy offending Amazon search scope will become opt-in (as the EFF, FSF and others have argued it should be). The bad news is that won't happen until Unity 8 arrives (hopefully 14.10, but possibly not until later). In other words, not in time for this LTS release. That makes 14.04 perhaps not quite as appealing of an upgrade for LTS users as it otherwise should be. If you're just one person installing Ubuntu on your desktop then it's pretty easy to turn off the privacy-violating bits. But Enterprise customers will most likely have to think twice about this upgrade, which is shame because for LTS users this is a problem that won't be solved until the next LTS rolls around in 2016.